How to choose wine? 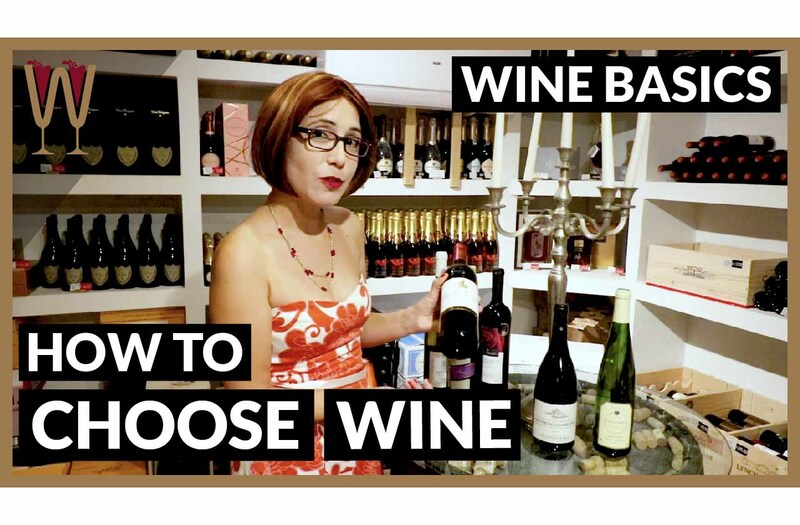 We get asked all the time on Social Media ‘How do you choose a bottle of wine’, so in this video WineScribble shares her secret wine tips on making a decision on a bottle shape and also a bottle label. The wine manufacturer has embedded clues for you in their choice of wine bottle shapes and also in their wine label design. For this video WineScribble is in Cavaway Wine Shop in Larnaca, Cyprus. Enjoy the video! Hey Tasters! We are in Cavaway in Larnaca. We’re in the cellar, there is a great variety of bottles. I love it here but I can see how this could be overwhelming. So I’ve had a couple of messages on Instagram. Two different people asked me: How do you choose wine once you’re in the shop? How do you make a quick decision? The best thing to do is to talk to an assistant, like Petros, but if an assistant like Petros, a friendly knowledgeable assistant, is not available? There are a couple of quick hacks that will help you make a decision. So, I had a message from Maria. Maria is planning a night in with the girls watching Netflix. She’s wondering all be appropriate what wine would be appropriate. I also had a message from… Adam feels that this is a very important dinner that he’s planning. He’s cooking for his father’s 60th birthday. He’s having the entire family over for a big family roast. How to Choose Wine: The big question! What wine would be appropriate? When you are in the cellar like this how do you make a decision? Especially if you’re not too familiar with grape varieties? Which wine to choose that’s right for the occasion? The first clue! The wine bottle shape. Bordeaux, Burgundy or Alsace? Your first clue as to what the wine might taste like is the shape of the bottle. We all reference French wine because when we use these shaped bottles we are suggesting to the consumer what a wine might taste like. The first one is the Bordeaux bottle the Bordeaux bottle. It is tall and narrow, it has high shoulders. It’s the classic bottle when you think of a wine bottle you’re usually thinking of a Bordeaux bottle. The second bottle shape is the Burgundy bottle, and this one has sloped shoulders and a wider base. Both of these bottles have a punt at the bottom. The third shape looks completely different. It’s unmistakable. It’s taller, a narrow very elegant flute shape. Usually no punt at the bottom and that’s known as the Alsace bottle. The Bordeaux, the Burgundy and the Alsace. So how does that help us know how to choose wine? Traditionally Bordeaux wine is a blend of Cabernet Sauvignon and Merlot. High in tannins, high in acidity, restrained fruit. A wine that begs to be paired with meat dishes. Roast beef, or lamb. Burgundy is more playful, funkier, spicier! Burgundy wines are traditionally made with Pinot Noir. They can be paired with with meats that are a little bit unusual, like duck, and they’re not afraid of earthy ingredients such as mushrooms. Last we have the Alsace bottle. The region of Alsace has been the passsed between Germany and France over the past few hundred years. Now, it’s a French territory but the wines produced there are very much in the German tradition You should expect an aromatic white a wine that is playful. Very floral, and full of baking spices like cinnamon and nutmeg. Let’s look at some other examples some new world examples and let’s see if these rules that I have given you can be applied. Let’s take this very distinctive bottle. Have you ever heard of the grape variety Morokanella? This grape variety nearly went extinct a few years ago, however it’s on the up now. It’s been rediscovered, and as you can see the producer has put it in an Alsace shaped bottle. So, when you look at this bottle, or a similar bottle, in the shop what can you guess about this wine? It will be an aromatic white. You should expect baking spices such as cinnamon, in fact the name of the wine is baby cinnamon: Morokanella and you should expect flowers. You should expect an aperitif a wine that can be drunk lightly on its own, if you want to, but very very floral. What about a Burgundy bottle shape? This bottle has a burgundy shape and it is indeed a Pinot Noir. It’s a Greek Pinot Noir. What we have here is a very different label. You have a modern design: big bold splashes of colour, old world wines have very traditional labels. A pencil sketch of a chateau, and gold lettering. A very traditional label. Old world wines tend to be cool climate wines, so you expect more acidity less fruit. New World wines, even if it’s the same grape variety, would be fruitier: lower tannins, lower acidity, more fruit! And the Bordeaux bottle shape? Back to the king of wines. This is the Bordeaux blend, the French Bordeaux blend, which is a blend of mainly Cabernet Sauvignon and Merlot. This is an old-world a wine with an old-world label, and you can see gold lettering. Very conservative, very traditional design. And, what I have here is two very modern designs, which are also in the Bordeaux bottle. The shape of the bottle is the same, but the label could not be more different. The red rose, there’s a fantasy name: it is called ‘the forbidden fruit’. Even more outrageous this bottle here, by Lazaridies. Very rocky, and in fact, apparently Joe Turner has also contributed to the making of this wine. They look very very different, but the bottle shape tells me that I should expect tannins, acidity, restrained fruit. A dark wine, a deep wine, a wine that needs to be paired with meat. So, Maria, to answer your question if you’re inviting the girls over for a night in, Think about what you’re serving. I’m going to guess you’re not going to put out a massive meal? You’re probably gonna have some light nibbles and some of these ladies make choose not to eat at all. Your best bet would be to go for something in an Alsace bottle. An apéritif that people can drink lightly over conversation. If you’d rather go for something that’s red, then go for a new world wine that’s fruitier, and can be drunk on its own, and has a bigger range of what that you can accompany. So, maybe a new world Pinot Noir. Adam you’re having the family over you’re going to serve a big traditional roast. But, for that you need to Bordeaux blend. Look for a Bordeaux shaped bottle, even if it’s not a traditional Bordeaux blend, even if it’s not Cabernet Sauvignon and Merlot. It will still be in the spirit of Bordeaux. It will still be a wine that’s deep, that’s dark, that begs for meat. High in tannins, high in acidity. If you don’t like wine to be that austere, then by all means go for a new world wine. That will be fruitier, but it will still have that same Bordeaux character that will elevate your beef roast. Guys, I’ve just, I’ve just been recommended this beautiful bottle. I can’t wait to take it home. Ktima Alexandrithi, it’s a Greek Syrah. It is organic. Is it organic? Right, when you go shopping I hope you guys are lucky enough to have someone helping you who is helpful and as knowledgeable as Petros! I only come here if Petros is here. This is a condition! Remember tasters, leave a comment in the comment section below we love talking about wine! And, if you haven’t subscribed yet do it now! I’ll see you on the next video. Okay! My region. From your region, really? This wine? Yes, yes this winery, where I learned all about wines. From this winery? That’s really exciting! Really, I spent a lot of time, I enjoyed them. So many times. Researching, darling! We call it research. A lot of times, I slept, a lot of times with this winery. But, I learned a lot of things!